HazChem® LLC Hazardous Materials HazClass® 2 Test Kit has added explosive for Nitrate and Perchlorate testing. 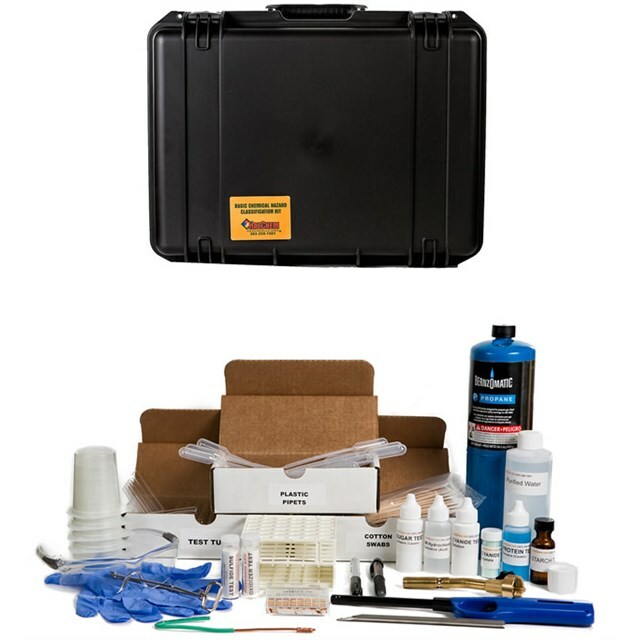 The HazClass® Kit 2 is a hazardous materials test kit designed to provide first responders a rapid and easy method to determine if unknown or suspicious materials present a possible chemical, radiological or biological hazard to the responder, population or surrounding environment. The procedure is not designed to identify the substance, but to determine if a possible hazard may exist. The HazClass® Kit 2 maybe used by any personnel with basic HazMat training skills. The HazClass® Kit 2 can be used in any situation where hazardous materials may be of concern. Abandoned containers or drums, illegal drug operations, chemical inventories, household chemical cleanups, unknown powders, suspicious materials, to confirm labeling, roadside dump sites, to determine bulking compatibilities, to check decon and PPE compatibility. The HazClass® Kit 2 can be used for the determination of EPA-RCRA Characteristic Hazardous wastes which are Ignitability, Corrosivity and Reactivity. The HazClass® kit will help in the determination of certain DOT classes, material compatibilities, and labeling for transportation and disposal.